STEP 1 Line the base and sides of a 23cm spring-form pan with baking paper. Remove ice-cream from the freezer and stand at room temperature to soften. STEP 2 Meanwhile, place all the berries into a bowl and gently toss to combine. Stand for 10 minutes. STEP 3 Place softened ice-cream into a large mixing bowl. Add yoghurt. Using a large metal spoon, gently stir to combine. Reserve 1 cup berries. Add remaining berries to the ice-cream mixture. Add chocolate and stir until well combined. Spoon mixture into prepared pan and flatten the top. 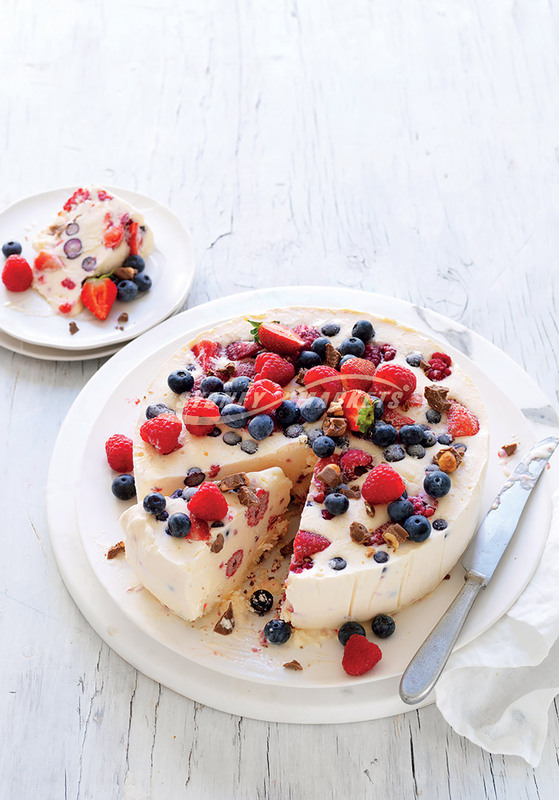 Scatter the top with reserved berries. Cover with plastic wrap and freeze overnight. STEP 4 To serve, remove cake from the freezer and stand for 5 minutes. Transfer to a serving plate. Scatter with a few extra fresh berries and serve.